Shaun Murphy won his third title of 2014 by beating Martin Gould 4-2 in the final of the Victoria Bulgarian Open in Sofia. World number seven Murphy played superb snooker throughout the European Tour event in the Bulgarian capital, conceding just seven frames in seven matches on his way to the 25,000 Euro top prize. After a barren spell of nearly three years, Murphy won the Gdynia Open and Haikou World Open last season, and now has his first title of the 2014/15 campaign. Former World and UK Champion Murphy dominated the opening frame before Gould took the next two with breaks of 60 and 45. But Murphy then stepped up a gear and fired in breaks of 89, 99 and 63 to win the last three frames in style. “Most of the matches this week have gone my way all the way through, but Martin really pushed me hard,” said Manchester-based 32-year-old Murphy. “At 2-1 I had to get myself sorted. I played really well after that. “It has been a brilliant year for me so far. I’ve been working very hard on my game and it’s really nice to see the fruits of that. I’m a much better player now than I was when I won the world title nearly ten years ago. Hopefully there’s more to come. I’m going to keep putting the hours in on the practice table and going for it. There will be no burn-out for me. Earlier in the semi-finals, Murphy beat Michael White 4-0 while Gould saw off Peter Ebdon 4-2. 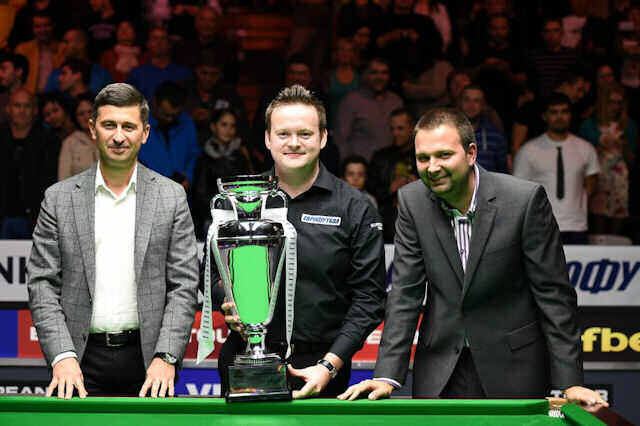 The 2014/15 European Tour series comprises six events across the continent, with the top 24 in the final Order or Merit to go through to the Players Championship next March to battle for the £100,000 jackpot. The next event is the Ruhr Open in Germany from November 19 to 23.